I've been training hard all summer, coming off Comic-Con and headed towards my buddy's wedding I didn't let up. Working out at home can be tough sometimes because you lose motivation but going to gyms out here is just a pain. I'm either up at 5:00AM and not at full strength or hitting the weights at 9:00PM and temping insomnia. At home I can get in a session before or after work in 15-60 minutes. Generally I stick to supersets or circuit training, that way I ensure the best pump in the least amount of time possible. Some people like to sit around for minutes on end after a set but I like to keep it non-stop so it becomes a light cardio workout as well because I loathe cardio. Jumping rope and running have become my friends but I'd rather just slam some iron. You don't need much in terms of equipment, I make due with a chin up bar ($20), a barbell and dumbbell set ($115), an exercise band ($10) and a jump rope ($10). That's $155 for 5 years of workouts for all you Poindexters out there. You can do weights in about a 5'x5' space in your bed or living room. I push the couch over and jump rope while watching TV. However a cold brought on by a night of whiskey took me off my routine followed by a busy week of professional and social activities before the wedding seemed to take the edge off my training. Now that the nuptials are over I figured on having a fat week. People always beat themselves up for falling off their eating and training plans but let's be honest, most of us aren't making a living because of how good our bodies look. And remember that nobody is in shape all the time. Not athletes, not actors, not anybody. 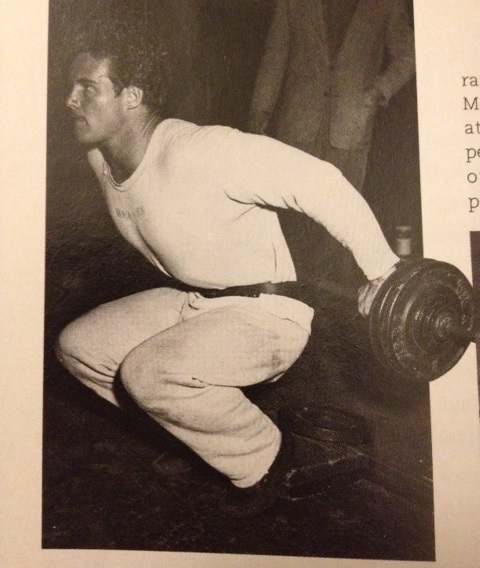 Today's one-two combo of weights and cardio was inspired by Daniel Craig and Steve Reeves. The former played James Bond in Casino Royale and caused quite the commotion with his beach scene while the latter was a matinee idol in his own right in addition to being one of the most iconic bodybuilders of all time, inspiring the likes of Sylvester Stallone and Frank Zane. Allegedly Craig did total body circuits 3 days a week to prepare. What's a Reeves Squat? Just the unofficial term I gave a type of squat I saw him doing in a magazine. Instead of having the weight across your traps like a typical squat, this variation has you holding the bar behind you and your heels elevated to put emphasis on the quad. This is easier to do at home so you don't have to throw the weight up on your shoulders then worry about getting it off. This was followed by jump roping for 300 skips or 2 minutes of intervals for a total of 6 rounds. All of this was done in under an hour, about 25 minutes for weights and 25 for jump rope and abs.